The sea and the desert: two gigantic forces in coexistence. Imaging the desert, first thing we see is a cold morning, when the sun starts its journey through the skyline and the sand is yet covered in the cold of the night. This is a very special time, when water in the form of the dewdrops begins to appear on the leaves of plants. Sun Drops makes reference to this moment when water comes into being at the desert. 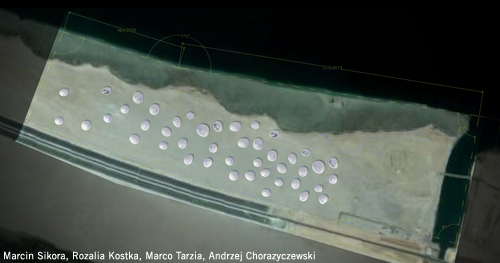 Oval-shaped forms made of glass, placed directly on the sand, resemble dewdrops at daybreak. The character of the whole composition is strengthened by the nearness of the sea. 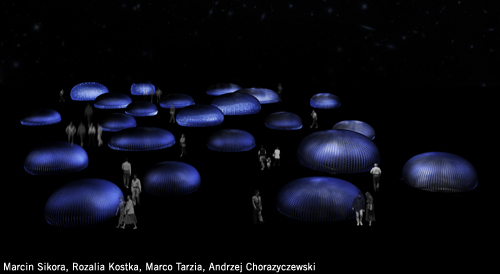 Irregularly located installations, illuminated from the inside at night, recall the picture of pure diamonds, sparkling at night. From the bird’s eye view they bring to mind water that has just been spilled on the sand, still not soaked into the ground. During the daytime, the Sun Drops change their character into glass domes, where hidden inside photovoltaic installations produce electricity. Glass forms, of which whole sphere is built, behaves like lenses, agglomerating and focusing light on the solar cells positioned inside. Produced energy is mostly transferred directly to the grid, but some is partially stored, so that it can be used to give power supply to illuminate the spheres at night.